The day before he delivered that controversial address, Netanyahu expressed similar sentiments to AIPAC, Israel’s powerful U.S. lobby. He reiterated the claim that Israel acted in the 1967 Six-Day War “to defend itself.” The narrative that Israel attacked Egypt, Syria, and Jordan in self-defense, seizing the Palestinian territories in the West Bank, Gaza, Jerusalem, the Golan Heights, and the Sinai Peninsula in 1967, has remained largely unquestioned in the public discourse. Israel relies on that narrative to continue occupying those Palestinian lands. And the powerful film Censored Voices, which premiered at Sundance in February, does not challenge that narrative. But declassified high-level documents from Britain, France, Russia, and the United States reveal that Egypt, Syria, and Jordan were not going to attack Israel and Israel knew it. In fact, they did not attack Israel. Instead, Israel mounted the first attack in order to decimate the Egyptian army and take the West Bank. For two weeks following the Six Day War, Amos Oz and Avrahim Shapira visited Israeli kibbutzim and recorded interviews with several Israeli Defense Forces (IDF) soldiers who had just returned from that war. Largely censored by the Israeli government for many years, those reels have finally been made public. Censored Voices features the taped voices of young IDF soldiers, as the aging former soldiers sit silently beside the tape recorder, listening to their own voices. In what proved to be a prescient question, one soldier asks: “Are we doomed to bomb villages every decade for defensive purposes?” Indeed, Israel justifies all of its assaults on Gaza as self-defense, even though Israel invariably attacks first, and kills overwhelming numbers of Palestinians — mostly civilians. Each time, many fewer Israelis are killed by Palestinian rockets. 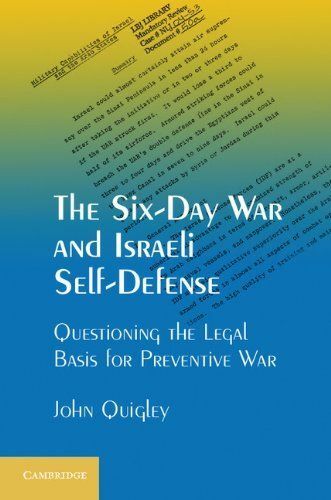 In his book, The Six-Day War and Israeli Self-Defense: Questioning the Legal Basis for Preventive War, published by Cambridge University Press, Ohio State University law professor John Quigley documents conversations by high government officials in Israel, the United States, Egypt, the Soviet Union, France, and Britain leading up to the Six-Day War. He draws on minutes of British cabinet meetings, a French government publication, U.S. documents in Foreign Relations of the United States, and Russian national archives. Those conversations make clear that Israel knew Egypt, Syria, and Jordan would not and did not attack Israel, and that Israel initiated the attacks. “After the cabinet vote,” Quigley writes, “informal discussion turned to ways to make it appear that Israel was not starting a war when in fact that was precisely what it was doing.” Moshe Dayan, who would soon become Israel’s Minister of Defense, ordered military censorship, saying, “For the first twenty-four hours, we have to be the victims.” Dayan admitted in his memoirs: “We had taken the first step in the war with Egypt.” Nevertheless, Israel’s UN Ambassador Gideon Rafael reported to the Security Council that Israel had acted in self-defense. Israel has abandoned its claim that Egypt attacked first. Yet “the international community” considers that Israel acted in lawful anticipatory self-defense. Quigley explains how the UN Charter only permits the use of armed force after an armed attack on a UN member state; it does not authorize anticipatory, preventive, or preemptive self-defense. The United States continues to support Israel by sending it $3 billion per year in military aid, even when Israel attacks Gaza with overwhelming firepower, as it did in the summer of 2014, killing over 2,100 Palestinians (mostly civilians). Sixty-six Israeli soldiers and seven civilians were killed.